We may not have known what comets were until the late sixteenth century, but humans have been recording their impressions of these orbiting ice balls for thousands of years. 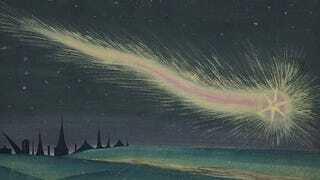 Some of the most beautiful art ever made reveals how long comets have been inspiring our imaginations. The Great Comet of 1744, also known as Comet de Chéseaux, on an engraving from Le Magasin Pittoresque, a French magazine published between 1833 and 1938.